When Spain returned to democracy in 1977 following the collapse of the Franco dictatorship, one of the thorniest issues to be resolved was the issue of regionalism. in returning to democracy, a compromise was reached. Spain was a single state, but at the same time extended autonomy to the various regions, although certain regions, such as Catalonia and the Basque region, received greater autonomy because their regional aspirations were more fully developed. The compromise generally held during the years of growth and prosperity. 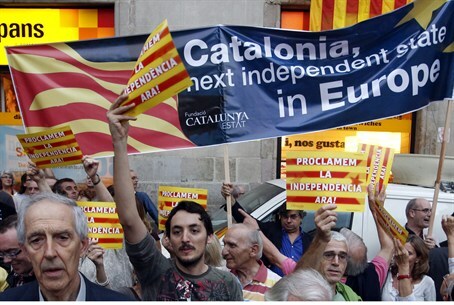 The European Union policy of encouraging regionalism was exploited by the Catalans and Basques to carve out further autonomy - even in relations with foreign governments. The Catalans and Basques also were courted as coalition partners and could use the negotiations to carve out further autonomy. Spain's current fiscal crisis has raised the national issue again. A major factor in the Spanish deficit has been the need to clear the debts of the regions that had enjoyed a good deal of fiscal autonomy. Catalonia, an economic powerhouse, is claiming that its deficit is not the result of fiscal mismanagement, but because it receives less from the central government than it contributes. Spanish Prime Minister Mariano Rajoy, whose party is descended from the forces that supported Franco (although the party has disavowed Franco-ism and the Franco dictatorship), objects to giving Catalonia special treatment, saying that all of Spain has to solve the crisis together. Paradoxically, if Catalonia was to secede,this would seriously impede the government's ability to help poorer regions of the country. Artur Mas, the president of the regional government of Catalonia, emboldened by a mammoth demonstration in Barcelona, is insisting on additional sovereignty, particularly in the field of taxation. Otherwise, he threatens to move up regional elections to generate a push for independence.